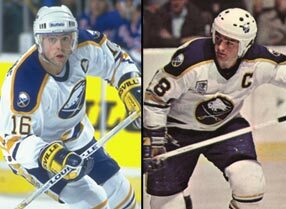 The Buffalo Sabres today announced they will be retiring the numbers worn by former captains Pat LaFontaine and Danny Gare in separate pre-game ceremonies later this season. Gare will have his number 18 retired prior to Buffalo's game against the New York Rangers on Tuesday, November 22. LaFontaine's number 16 will be retired in a pre-game ceremony on Friday, March 3, before the Sabres play host to the Toronto Maple Leafs at 8 p.m.
Gare played with the Sabres from 1974-81, scoring 500 points (267+233) in 503 games. He scored 50-goals twice during his career, including a league-best 56 in 1979-80. LaFontaine was in Buffalo from 1991-97, finishing with 385 points (158+227) in 268 games. He still holds the Sabres single-season record with 148 points and 95 assists during the 1992-93 season. The organization has retired only four numbers since the franchise's inception in 1970. The first Sabre to have his number retired was Gilbert Perreault (#11) on October 17, 1990. Rick Martin (#7) and Rene Robert (#14) were honored together on November 15, 1995, in a joint ceremony with Perreault to retire all three numbers from the famed French Connection. The fourth Sabres player to have his number retired was Tim Horton (#2), on January 15, 1996. Danny Gare was selected by the Buffalo Sabres in the second round (29th overall) in the 1974 NHL Amateur Draft. Gare played his first game for the Sabres on October 10, 1974 against Boston, and scored just 18 seconds into his first NHL shift. Gare finished his Buffalo career ninth all-time in scoring with 500 points. Gare reached the magical 50-goal plateau twice in Buffalo, scoring 50 in 1975-76, and later tied for the league goal-scoring title with a career-best 56 in 1979-80. In his rookie season Gare scored 62 points (31+31) and contributed 13 points (7+6) in the Sabres run to the 1975 Stanley Cup Finals. Gare followed up his strong rookie campaign with his first of two fifty-goal seasons in 1975-76, when he potted 50 goals and 23 assists in 79 games, and chipped in two game-winning goals in the playoffs. That season, Gare scored three of his 10 career hat tricks as a Sabre. Gare's 56 goals in 1979-80 were the most by a Sabre until Alexander Mogilny scored 76 goals in 1992-93. That same year, Gare scored 11 game-winning goals, a Sabres single season record that was tied by Mogilny in 1992-93. His six game-tying goals in 1977-78 are still a Sabres single season record. With 267 goals as a Sabre, Gare holds the career record for goals by a Sabres right wing. He also holds the career record for game tying goals with 21. His 35 game-winning goals and 267 goals are both fourth all-time for the Sabres. Rick Martin is the only other Sabre to have two fifty-goal seasons. Gare's career as a Sabre came to an end on December 2, 1981 when he was traded to the Detroit Red Wings along with Jim Schoenfeld and Derek Smith, in exchange for Mike Foligno, Dale McCourt and Brent Peterson. After four and a half seasons in Detroit, Gare played 18 games with the Edmonton Oilers in 1987-88 before retiring from the NHL. Gare finished his 13-year NHL career with 354 goals, 331 assists and 1,285 PIMs in 827 games. He was twice elected to the NHL All-Star team, and was named the Sabres' Most Valuable Player three times. Following his playing career, Gare was an assistant coach with the Tampa Bay Lightning for 1993 through 1995. Gare then spent seven seasons (1997-2004) on the Sabres broadcast crew, working as an ice level reporter. He also served as the team's radio color analyst during the 1995-96 season. Gare now works with the Sabres youth hockey programs, serving as an instructor for clinics throughout Western New York and Southern Ontario. A native of Nelson, B.C., Gare was elected into the Sabres Hall of Fame in 1994. Pat LaFontaine enjoyed an illustrious 15-year career before retiring from the NHL in 1998 as the second highest scoring American-born player in league history with 468 goals and 1,013 points. He was born in St. Louis but grew up in the suburbs of Detroit, and is still considered to have been among the game's best playmakers, fastest skaters and most humble of superstars. In 2003, Pat was selected for enshrinement in both the Hockey Hall of Fame in Toronto and the United States Hockey Hall of Fame in Eveleth, MN. This marks the first time that any player has been elected to both halls in the same year. The induction ceremony for the U.S. Hall took place in October 2003 in Eveleth, MN, while the Hockey Hall of Fame induction took place in Toronto in early November. LaFontaine was selected third overall by the New York Islanders in the 1983 NHL Entry Draft after a brilliant season with Verdun of the Quebec Major Junior Hockey League. He led the QMJHL with 104 goals, 130 assists and 234 points, won the MVP award in the regular season and the playoffs, was named the Canadian major junior player of the year and the league's Most Gentlemanly Player. LaFontaine spent the 1983-84 season with the United States national team, and was the club's leading scorer at the Sarajevo Olympics before making his NHL debut with the New York Islanders on February 29, 1984. He scored his first goal three nights later when he recorded a hat trick against the Toronto Maple Leafs. LaFontaine increased his scoring output in each of his first four NHL seasons, tying Mike Bossy for the Islanders lead with 38 goals in 1986-87. On April 18, 1987, LaFontaine scored at 8:47 of the fourth overtime period to give the Islanders a seven-game playoff series victory over the Washington Capitals in one of the longest games in NHL history. The 1989-90 season saw LaFontaine join Bossy and Bryan Trottier as the only players in Islanders history to score more than 50 goals in a season. His 54 goals and 51 assists placed him in the top 10 in scoring in the NHL that season. However, after just one more season, LaFontaine was traded to the Buffalo Sabres in a multi-player deal on October 25, 1991. His 46 goals in 1991-92 led the Sabres and set a club record for centers, which he broke the following year when he scored 53 times. His career-high 95 assists and 148 points that season placed him second to Mario Lemieux in league scoring, and earned him a spot on the All Star team. A serious knee injury sidelined LaFontaine for most of the 1993-94 season, but he returned as team captain in 1994-95 and was awarded the Bill Masterton Trophy for perseverance and dedication to hockey. After another good season in 1995-96, LaFontaine missed most of the 1996-97 campaign after developing post-concussion syndrome. That year, he was named recipient of the Lester Patrick Award for outstanding service to hockey in the United States. Pat achieved the "Empire State hat trick" by playing for all three NHL organizations within New York State, when he was traded to the New York Rangers on September 29, 1997. He remained one of the Rangers' leading scorers until another head injury forced him to prematurely retire on August 11, 1998. In addition to his Olympic experience in 1984, LaFontaine has represented the United States at the World Championships in 1989 and at the Canada Cup in 1987 and 1991. He was a member of the American team that beat Canada at the World Cup of Hockey in 1996 and also played for the U.S. Olympic team in Nagano in 1998. He was the first active player to receive the USA Hockey Distinguished Achievement Award, presented to a U.S. citizen who has made hockey his or her profession, and has made an outstanding contribution to the sport. He has been symptom-free of concussions since October 1998 and has moved easily in post-hockey life. He is involved in a management and design capacity in a home renovation business, and is getting a chance to watch his children grow up. In 2000, the Congressional Medal of Honor Society bestowed the Patriot Award on LaFontaine in recognition of his contribution to military morale throughout his career. In 2002, LaFontaine was named one of the recipients of the First Annual Honorary GOAL! Award. The GOAL! (Go On And Live) Awards recognize and celebrate individuals who have overcome depression and demonstrated an ability to "go on and live" through volunteering and community service. The initiative is sponsored by the Points of Light Foundation. In April 2003, LaFontaine was recognized with the International Humanitarian Award by the Gift of Life Foundation, an organization promoting the cure and treatment of children suffering from heart disease in third world countries. In March 2004, Pat was inducted into the Michigan Sports Hall of Fame at a ceremony in Detroit. He is the president and founder of Companions in Courage Foundation (www.CiC16.org). Working with firms such as Microsoft, Cisco and ESI Design, the group's focus is to build interactive game rooms (the Lion's Den) in children's hospitals throughout North America. Through innovative communications tools, these playrooms will replace the isolation of a hospital stay with a connection to family, friends and celebrities for each child. With the help of the Sabres organization and Tom and Heather Golisano, LaFontaine opened a Lion's Den Room at Women and Children's Hospital in Buffalo, NY earlier this year. The room features a wall of Xbox games, personal computers, a flat panel video monitor for movies and a video conference pod. The unique design and lighting in the room allows each patient to enjoy a respite from the mundane day-to-day of a hospital stay. There are plans to open as many as six new rooms in additional hospitals during the next few months.